Coffee is the most important meal of the day! 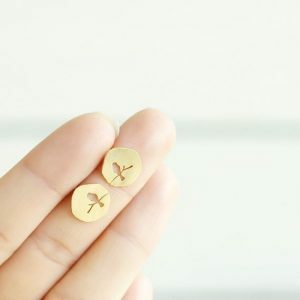 These stud earrings are perfect for the coffee lover then these studs are perfect for you. These silver stud earrings have a simple molecules design. You can combine it with your other jewelry. Wear it together with other silver jewelry. For example with a nice minimalist necklace or with a stylish ring. 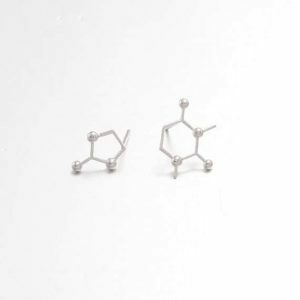 Do you have questions about these molecule studs earrings? Send us a message. Coffee lovers pay attention! Is your daily dose of coffee not enough for you? then these cup and coffee bean stud earrings are perfect for you. Minimalist jewelry is super fun ! you can wear it every day because it is easy to combine. 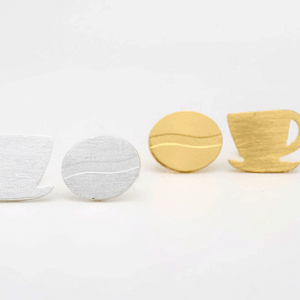 These simple earrings are in the shape of a cup and coffee bean. Wear it together with other minimalist jewelry, go for a beautiful bracelet or just with a nice necklace. Do you have questions about the cup and coffee bean stud earrings? Send us a message. ” Less is more ” Do you want to look elegant? 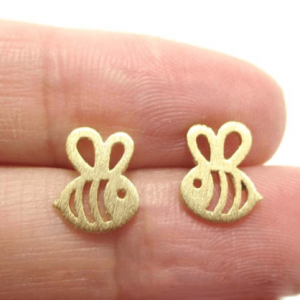 then these subtle earrings are perfect for you. The subtle, fine design makes it easy to combine with other jewelry. These stylish earrings should definitely not be missing in your jewelry collection. You can wear them with a simple t-shirt with jeans, but they will also look great with a beautiful dress. Finish your look with a subtle layer necklace from Aphrodite. Do not forget to decorate your fingers with simple rings. ???? Subtle earrings are super fun! 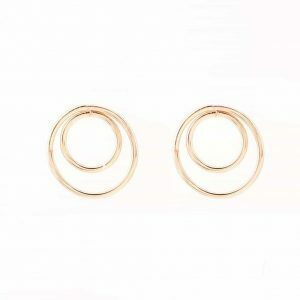 These earrings have a round design, with a v shape in the middle. 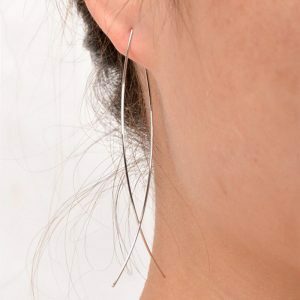 Combine it with other silver earrings for an ear party. You can easily combine it with your daily outfit. Wear these earrings together with other silver jewelry. For example with a nice minimalist necklace or with a stylish ring. Do you have questions about the silver subtle earrings? Send us a message. These trendy leopard earrings should not be missing in your jewelry collection. 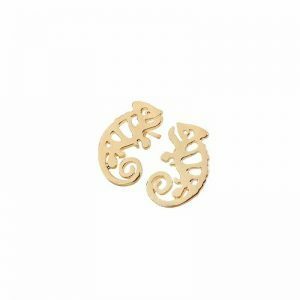 There is a leopard charm on these little earrings. Combine these trendy leopard earrings with one of our cute short necklaces. Or with a nice layered necklace in the color silver. ???? did you know that the leopard is also called the panther? Combine it together with other minimalist jewelry. 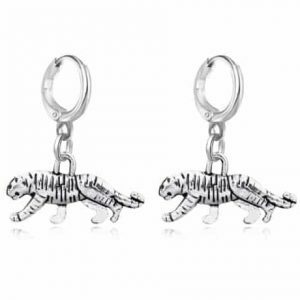 The perfect trendy earrings for the animal lover! We are obsessed with jewellery! This earrings set consists of 8 different earrings. Do you have 2, 3 or multiple ear holes? then you can make your own ear party. Mix and match it with other earcandy. Combine it with gold jewelry. For example with a stylish layered necklace or with a nice bracelet. Do you have questions about the 8-piece earrings set? Send us a message. Hi lovely! How nice is this 5 piece earrings set. This beautiful earrings set consists of 3 studs earrings and 2 earrings. Do you have 2, 3 or multiple ear holes? Then make your own ear party! You need different jewelry for every occasion. 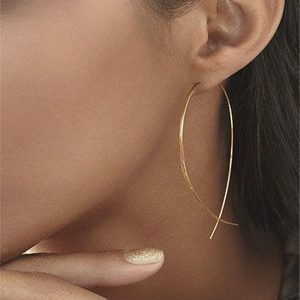 You can wear these earrings to school / work but also when you go out for a night out. Combine it with other gold jewelry. For example with a layered necklace or with a stylish bracelet. 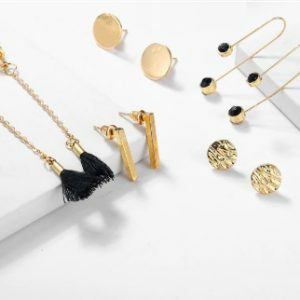 Do you have questions about this 5 piece gold earrings set? Send us a message. 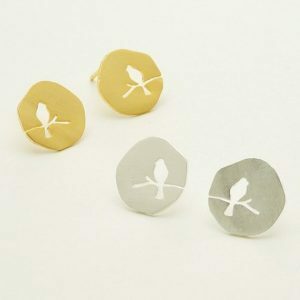 This earrings set consists of 3 minimalistic studs earrings. 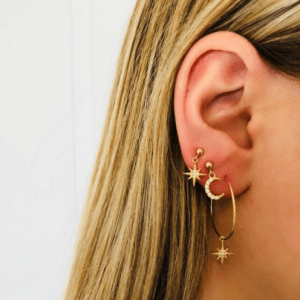 An earring in the shape of a moon, an earring in the shape of a star and a heart stud earring. 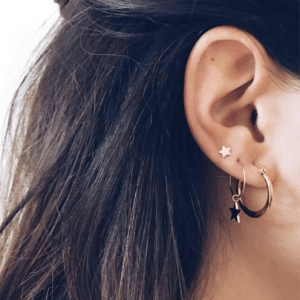 You can make your own ear party with these cute earrings. Complete your look with other silver and gold jewelry. Example with a stylish layered necklace or with a nice bracelet. You need different jewelry for every occasion. You can wear this beautiful earrings set to school / work but also in your spare time. 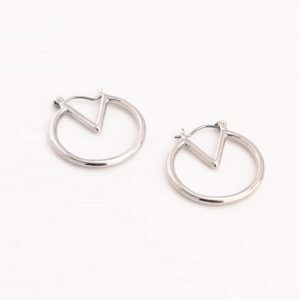 Do you have questions about this earrings set with minimalist earrings? Send us a message. 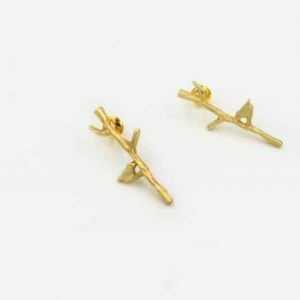 Studs earrings in the shape of a bar are a real must have in your jewelry collection. Minimalistic jewelry is super fun! you can wear it every day because it is easy to combine. 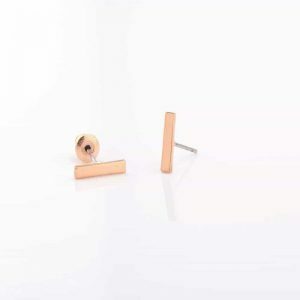 These simple earrings are in the shape of a bar. Wear it with other minimalist jewelry. For example with subtle, fine necklace or with nice bracelets. They have a size of about 1 cm. The studs earrings are available in the colors gold and silver. The studs earrings are made of the material Alloy. These earrings should not be missing in your jewelry collection. Do you have questions about the bar studs earrings? Feel free to send us a message. 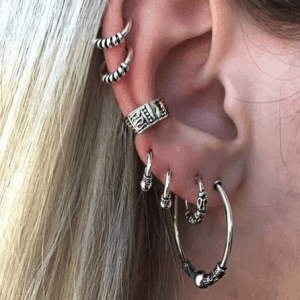 Hoe cute zijn deze studs oorbellen ?! Deze subtiele studs oorbellen zijn in de vorm van een bij. Mix en match het met andere minimalistische oorbellen voor een earparty. Combineer het met andere gouden sieraden. Bijvoorbeeld met een subtiele, fijne ketting. Of met een leuke armbandje. Deze prachtige sieraad is verkrijgbaar in de kleuren zilver en goud. Voor welke kleur ga jij ? Heb je vragen over de bij studs oorbellen ? Stuur ons dan gerust een berichtje. 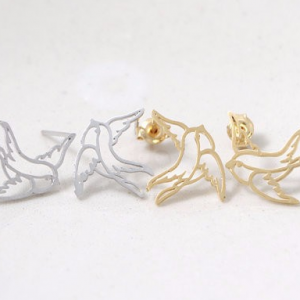 These gold earrings have a bird on branch design. 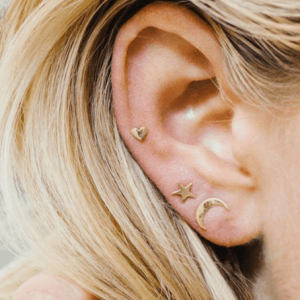 Wear multiple stud earrings for an ear party. Combine it with other gold jewelry. For example with a nice long necklace with stylish bracelets. Simple, contemporary and easy to wear with anything. A true classic, these earrings are made to be worn with anything. 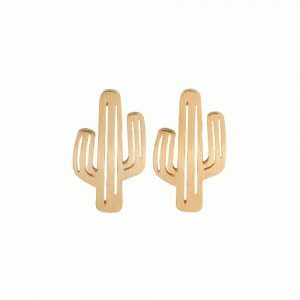 From the office, to the restaurant, to the cinema, these stud earrings will go anywhere with you. We are obsessed with jewellery! 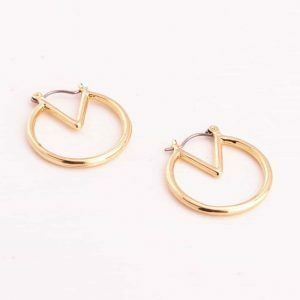 These gold earrings have a double triangle design. The subtle design makes it easy to combine with your daily outfit. Wear it together with other gold jewelry. For example with a nice necklace or with a stylish bracelet. 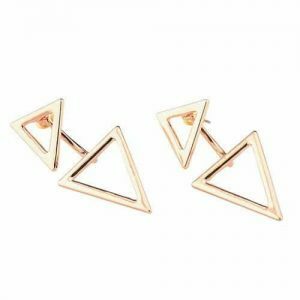 Do you have questions about the Earrings with double triangle design? Send us a message. Minimalist stud earrings are super fun and practical! 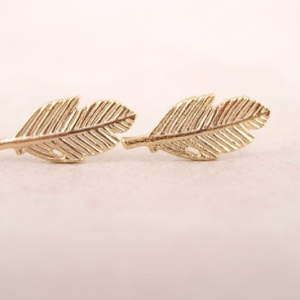 These cute studs earrings are in the shape of a leaf. Do you have 2, 3 or more ear holes? mix and match it with other lovely ear studs for an ear party! You can easily mix and match them with other minimalist jewelry. For example with a subtle, fine bracelet or a Y – lariat necklace with leaves. ???? Decorate your ears with this beauty! 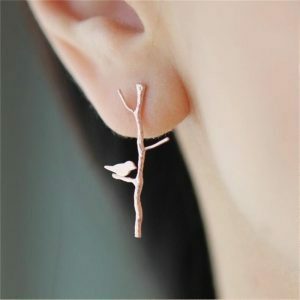 Do you have questions about the minimalist leaf studs earrings? Feel free to send us a message. 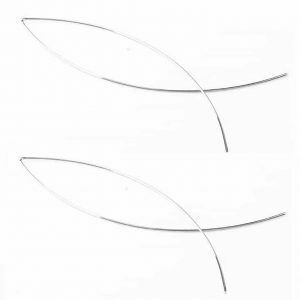 Decorate your ears with these subtle long earrings. 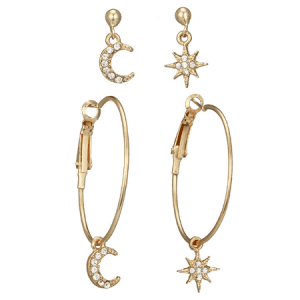 A small circle-shaped pendant hangs on these gold earrings. The minimalist design makes it easy to combine with other jewelry. Complete your look with a beautiful ring or a stylish bracelet. 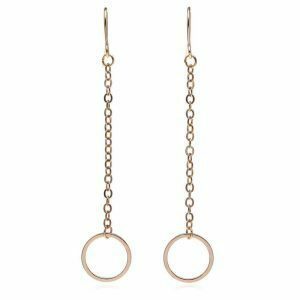 Do you have questions about the long gold earrings with a circle pendant? Feel free to send us a message. Are you looking for elegant delicate earrings, then you’re in the right category. 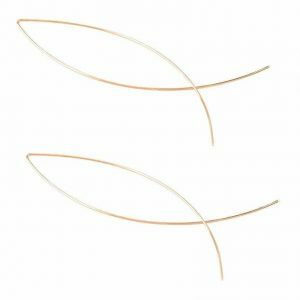 These delicate earrings come in the form of, for example, a bar, circle or triangle. The earrings are stylish and timeless. You can take them to school, work, while shopping or wear to a date. The minimalist design makes them suitable for both day and night. As a modern woman you can wear it with other subtle accessories. 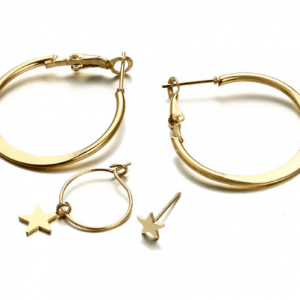 With a nice subtle bracelet or subtle rings, the minimalist earrings are a perfect match.